Mission Impossible? Not for Tindall. A request for a top-notch office structure in a competitive, upscale market with limited building space? A tight budget? The need for high occupancy? That’s just the kind of challenge Tindall lives for. This eight-story, total precast office building utilizes a utilitarian, load-bearing architectural exterior, making it both functional and aesthetically stunning. Cast in a white concrete mix with intricate reveal patterns, projections, openings, and cornices, this design complements the existing cast-in-place plaza complex, echoing the sophisticated look of the Atlanta subcity of Buckhead. The decision to make the architectural cladding integral with the structure allowed for more ornamentation than the budget originally included. The exterior of the construction is more than visually stunning—it is load bearing for the tri-slab floor members and provides lateral resistance in the north-south direction. The tri-slab composite concrete floor system was designed as continuous spans, reducing deflections and structural depth, while closely emulating cast-in-place construction. 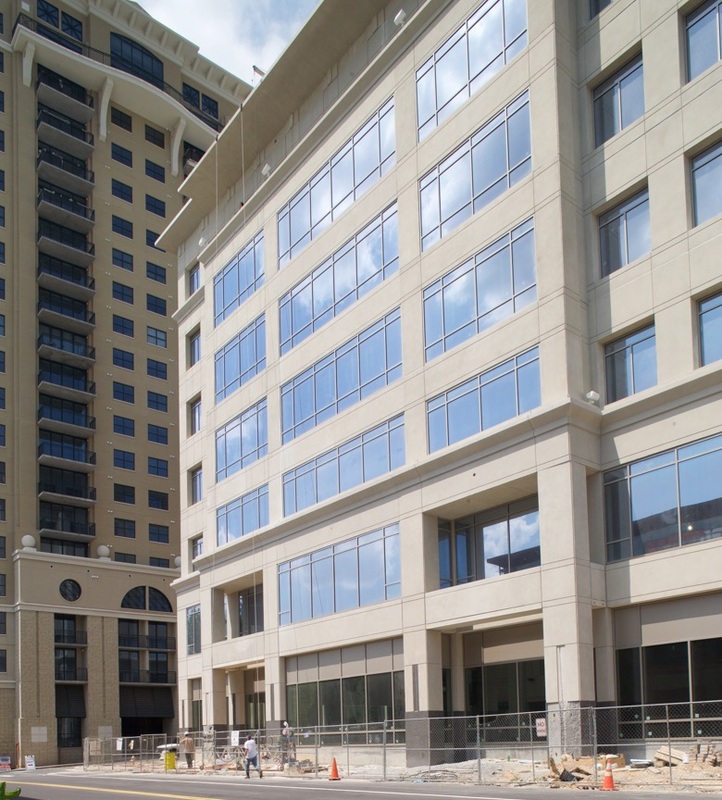 Two Buckhead Plaza Office Building was awarded the 2007 Precast/Prestressed Concrete Institute’s (PCI) Harry H. Edwards Industry Advancement Award. "The innovative features implemented into this total precast building make it worthy of award. This is not the first total precast building, and it won’t be the last, but there is definitely something new and unique about the use of so-called W-beams. The beauty… is that they also provide for structural integrity, something we all anticipate will be implemented in the next building code cycle."